← What’s that Nip in the Air? French Fridays with Dorie started off September with a bang. I loved the first two recipes. I’ll admit up front that I wasn’t all that excited about this one: Cinnamon-Crunch Chicken, but I’ve learned to trust Dorie to be surprising, so I didn’t sit out this week and gave it a try. It turned out that this recipe couldn’t have been simpler for a weeknight meal. First, you crush some cookies, LU Cinnamon Sugar Spice, which I love to snack on. You stir the cookies into crème fraiche, and set the sauce aside. 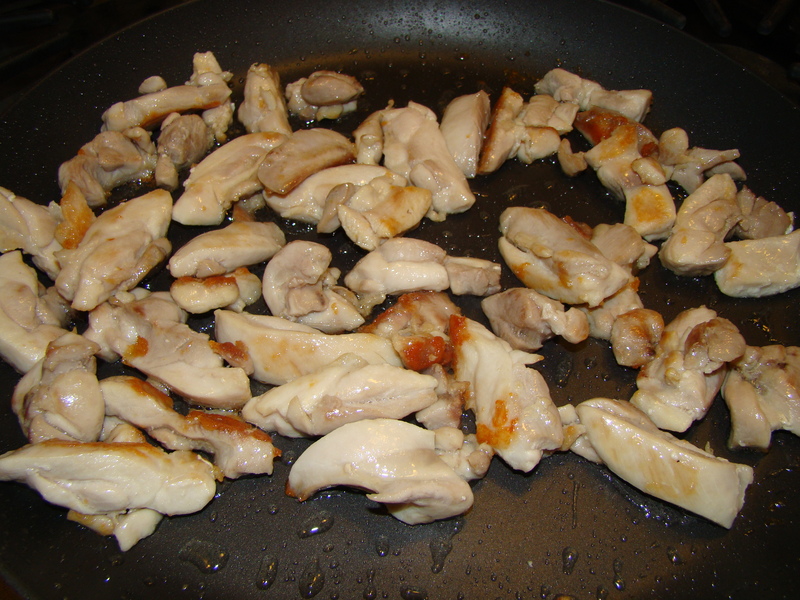 Then, you sauté strips of chicken in olive oil until they are cooked through and nicely browned. The recipe called for chicken breasts, but we’re more of a dark-meat household, so I used boneless thighs instead. Finally, you add the sauce to the pan, heat it to a boil, and let it bubble for a minute or so. Voila! That’s it! I served the chicken over Dorie’s cardamom rice pilaf with a light green salad. Preparing the entire meal took less than half an hour from start to finish. What was the verdict? It was mixed. I started with low expectations, but it was more interesting than I thought it would be. I liked the contrast of the tangy crème fraiche with the sweet cookies. 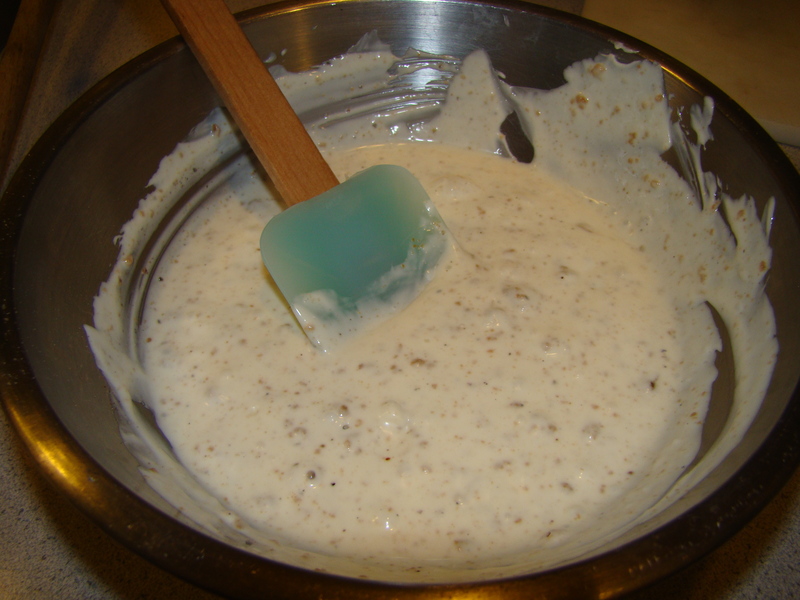 While I’ve used crème fraiche in room temperature dishes before, I’ve never heated it up. 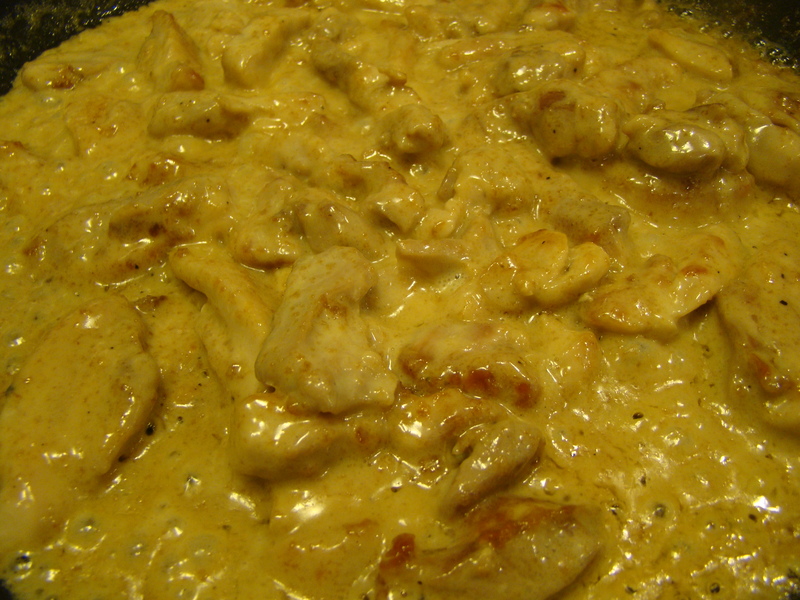 As promised, it didn’t curdle, and the end result was a thick and creamy sauce. A little big of magic. On the other hand, Howard said “I don’t think I like cinnamon in my dinner”. He ate it for dinner and took leftovers for lunch, but wasn’t a big fan. It was definitely worth a try, but probably won’t make it again. On the up side, the recipe only used two cookies, so I get to munch on the rest of the box. We don’t share the recipes, but you can find in Dorie Greenspan’s book Around My French Table. And, even though this wasn’t a favorite, I will still enjoy checking out what my fellow FFwD bloggers thought about the week’s recipe. They are a creative bunch. You can find their links at French Fridays with Dorie. This weekend, I’m excited to be trying out Dorie’s new iPad “Baking with Dorie” app. I haven’t tried cooking with a computer tool at hand before. It’s actually Howard’s iPad, but if he likes what I choose to make, he’ll share. I’m not sure which recipe I’ll try first, but I’m thinking maybe the Peanut Butter Torte. Other weekend plans include enjoying the “A Taste of Greece” festival at St. Nicholas, the local Greek Orthodox church, tonight. I look forward to the homemade food, and especially the desserts, every year. On Saturday, Howard and I will share a special dinner out to celebrate our 20th wedding anniversary, which was yesterday. 19 happy years (the first one didn’t count) and many more to come! Posted on 16 September 2011, in French Fridays with Dorie and tagged chicken, French Fridays with Dorie, rice. Bookmark the permalink. 10 Comments. Looks delicious. And, I think munching on the cookies as my dessert was my favorite part as well! Like you, I liked this enough to try it once, but I found the taste of sweet cinnamon in my savory chicken a little bit odd. So I’m not sure if I’ll make this again either. Yours look creamy and delicious! So funny about using the iPad in the kitchen. Because I store my recipe notes on my iPad, most days it’s dusted with flour or I’m wiping spilled sauces off it! You try it and see. Oh, Happy Anniversary in advanced! Yours looks so creamy and I bet was delicious over the cardamom rice! Please let us know how you like Dorie’s app. I haven’t gotten my iPad yet, but when I do I would like to get Dorie’s app – was a little surprised at how pricey it is though. Happy Anniversary, Betsy! I hope you have a wonderful celebration. Your weekend sounds like so much fun. I haven’t been to the Greek festival here in the last few years, but the food is always fabulous. Happy Anniversary! What a great milestone. LOL – I love your thinking on the upside. I liked this dish, but used gingernuts instead of speculoos. I was away and never got to try this chicken dish. However, the reviews don’t seem to be great…so I just might skip it! Glad you tried this one and enjoyed it! Happy 20th Anniversary! My husband and I just spent the weekend in NYC to celebrate our 44th! It was the 16th! September’s a good month!